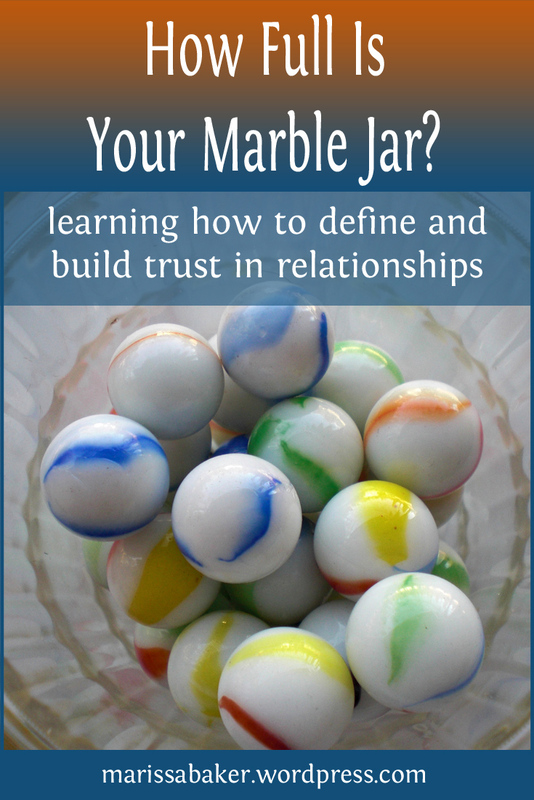 How Full Is Your Marble Jar? I have issues with trust. I knew this to a certain extent, but being in a relationship has brought it to the forefront of my attention. My boyfriend wants to build the kind of trust that I’ve always wanted in a relationship, which is fantastic. But it’s harder to get there than I was expecting and that’s frustrating for both of us. I probably feel safer with him than anyone else who I haven’t known a minimum of 10 years and yet I still feel nervous opening up to him and being “me” around him. As I mentioned a few weeks ago, I love Brené Brown’s TED talks. Since writing that post, I’ve read her book The Gifts of Imperfection and I’m halfway through Daring Greatly. Since I’ve been confronting some deep-seated fear issues as well as this trust thing, they’ve been really good books for me. They’re tough, though. For example, she has a list of 10 things that “Wholehearted” people who believe in their worthiness do. I’ve only got one down pretty good and maybe half of two others. And that’s even though all 10 points on the list are things that, in theory, I agree are good and which I’ve considered worth pursuing for quite some time.